We have returned. What a fantastic last day! 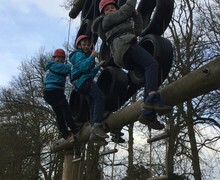 Jacob's ladder and fencing were our last activities and once again we all had a fantastic time. 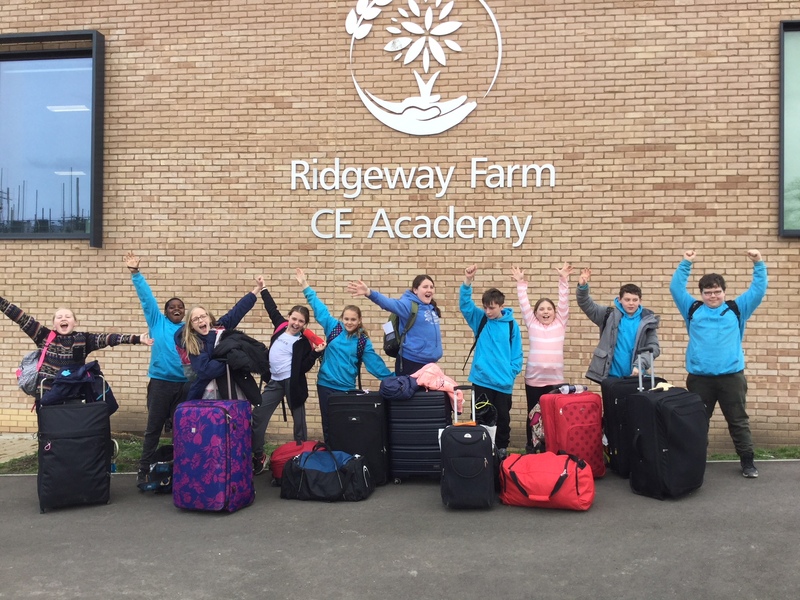 This week has just proved what fantastic children we have at Ridgeway Farm. 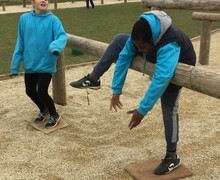 The staff of Ridgeway and Lydiard have been so impressed with the behaviour of the children and their respect for each other and all the adults. Well done Ridgeway. You can definitely tell it’s coming to the end of the week. Everyone is looking tired and rather muddy! However they all still have huge smiles on their faces and are still giving everything their all. 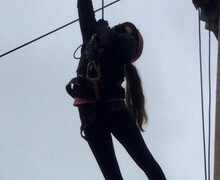 Today we started by harnessing up for Trapeze. I think Ola, Sienna and Seb are ready to join an acrobatic display! Their jumps and swings were fantastic! Everybody else conquered their height fear and made it to the platform to jump off. I was so impressed with how everyone was cheering each other on and being so supportive. 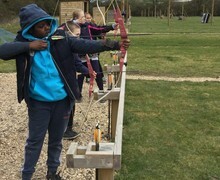 After, it was time for archery and Jayden and Isobel had the perfect shot with a perfect bulls eye. 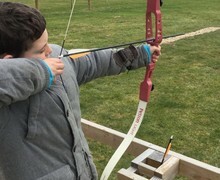 We all had to make sure we stayed well out of Jerome and Ryan’s shot - a nearby pheasant was looking fearful as their arrows flew past the targets. For lunch today we filled our own tacos and wraps accompanied with tortillas. Those that still had money left for the shop have bought their last few souvenirs and sweets from the gift shop. 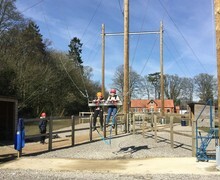 This afternoon’s activity was zip wire and challenge course. Cori, Alyssa and Alicja absolutely loved zipping down from the top many times! They thought they were birds! 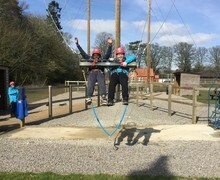 Ola and Sienna did a superb job at zip wire and supporting others to go even when they were nervous. 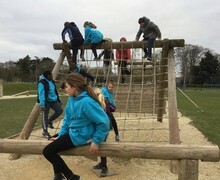 After zip wire we all attempted the challenge course. Jerome, Ryan and Harvey must twilight as Spider-Man, crawling and swinging around with great skill over ropes, walls and along beams. Tonight for dinner we enjoyed beef bolognese, chicken and mushroom pie and Mediterranean vegetables with pasta. We finished off the perfect week with a lovely campfire, sing song and marshmallows. Time now back to bedrooms for packing and tidying! We can’t wait to see friends and families tomorrow. The sunshine felt so good today! It was so nice having some warmth for our activities. 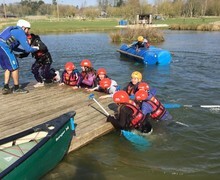 This morning everybody took part in the raft building but it did not all go quite to plan. 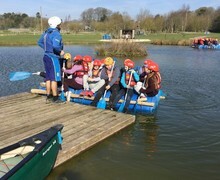 They were fantastic at working together, making knots and getting their raft to float. They were not so great at staying on the raft however and they went for an early morning swim that they were not planning on having. Funnily enough, Jerome, the only person to get wet yesterday was left as the only person on the raft bone dry. 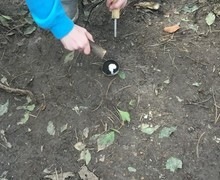 A few decided to be absolute troopers and continued to have a go whilst the rest quickly got dry and warm. 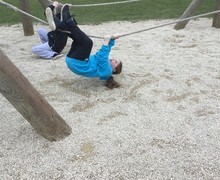 Our next challenge was Giant Swing. Ryan and Cori showed amazing emerald power of courage as they went higher than they thought they could. Isobel was a great encourager. 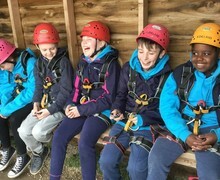 Everyone had massive smiles on their faces as they enjoyed their swing. Then it was time for lunch which today was fish fingers and chips. Everybody is eating lots and enjoying all the delicious meals. We started the afternoon by being the only survivors on site. 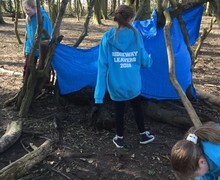 We built dens in the woods and learnt how to start fires. Alyssa showed amazing perseverance and would not give up until she had lit that fire! 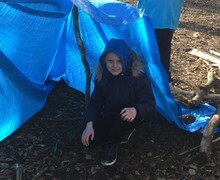 It was a competition however of who could build the best den and I definitely would have rather stayed in the girl’s den. I would have been very soggy in the boy’s den! 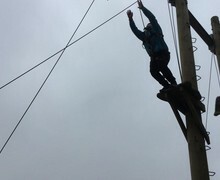 Our last activity of the afternoon was vertical challenge. 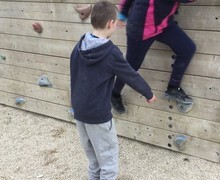 This involved the children climbing up an obstacle course as high as they could. 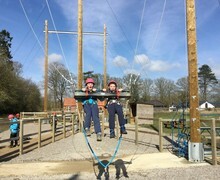 Ola and Sienna flew up to the top. 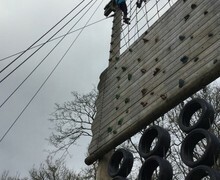 Everybody pushed themselves to climb as high as they could go and did brilliantly. 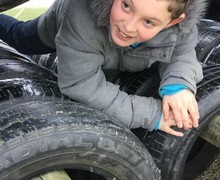 Jayden was fantastic in supporting not only the Ridgeway team but the Lydiard team in climbing the rope ladders. For dinner tonight we had meatballs and pasta, lasagne and butternut squash risotto. For our evening entertainment we played team sports and Alicja and Seb were so great at mixing with both schools showing some fantastic sportsmanship. 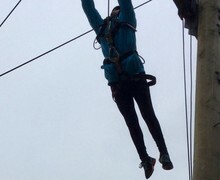 Tomorrow we have trapeze, archery, zip wire and challenge course. Well I did say famous last words last night, but the children all had a fantastic nights sleep and were well refreshed for this morning. 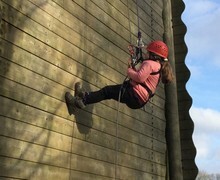 Today we have had a fantastic first day at PGL. We have been pushed out of our comfort zones, tried new things and most importantly worked together as a great team. This morning started with a cold session canoeing. 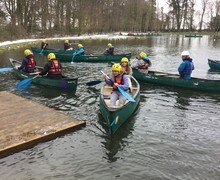 Ola and Sienna showed some impressive paddling skills as they worked well to move around the lake with plenty of splashing too. 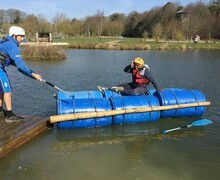 The award for the biggest splits goes to Jerome who managed to try and climb out of his canoe and fell into the water! All with a smile still on his face. 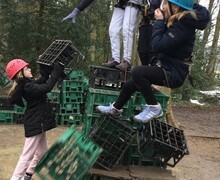 Our next activity was crate challenge and the group worked so well as a team stacking crates, belaying for each other and cheering each other on. We stopped then for lunch and had a warming jacket potato with different fillings. 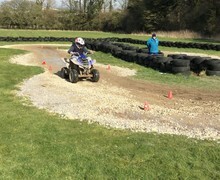 After lunch it was time for Quad Biking, Harvey proved he was a pro at speeding round the gravel track. 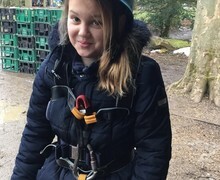 We finished the day with abseiling and the abseiling star was Alicia who not only overcame her fear of stairs with gaps but also went to the top of the tower and abseiled all the way down. 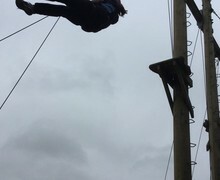 They loved this activity so much. After a dinner of chicken nuggets and chips, the group visited the shop and stocked up on gifts and souvenirs. We then have played a hide and seek game of Ambush and for once the children were incredibly quiet and still! I think a sign they were starting to get tired. 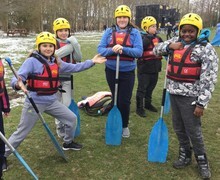 Tomorrow we have raft building, giant swing, survivor and vertical challenge. 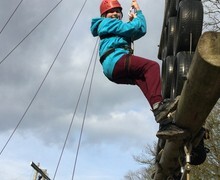 What a fantastic start to PGL! This morning in school we had fun playing team building games and working together. We then made our PGL charter establishing how we want to get the best from our week. 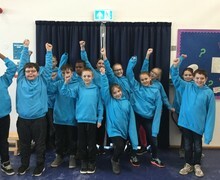 We were so impressed with how the children just wanted to make new friendships and make Ridgeway proud - which we already are. 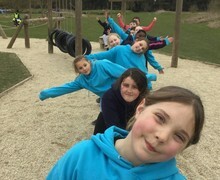 Once we arrived at PGL we quickly became familiar with our surroundings and settled into the bedrooms. I have to say I have never seen such tidy rooms - I wonder how long it will last! 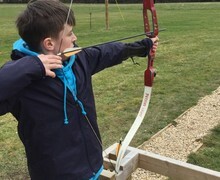 After some more team games with Lydiard, in the snow, we had a lovely warm meal of curry, sausages or pie. The jam doughnuts for desert were a definite winner. Tonight we have played more team games and have now returned home to warm up, get washed and pack our day bags for tomorrow. I have a feeling from looking at their tired little faces that lights out will be quick tonight - maybe famous last words! 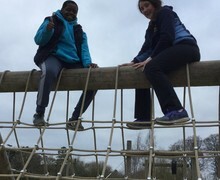 We will update you tomorrow after our activities of canoeing, crate challenge, quad biking and abseiling.